But for her, it was just Tuesday…. May-September-Battle of Nomonhan between Japs and Soviets. September 1st- Germans invade Poland. September 3rd- Great Britain, France, Australia, and New Zealand declare war on Germany. September 10th- Canada declares war on Germany. September 17th- Soviets invade Poland. November 30th- Soviets invade Finland. December 17th- "Graf Spee" scuttled. March 12th- Finland signs peace treaty with Soviet Union. March 30th- Setting up of Wang Ching-wei's puppet government at Nanking. April 9th- Germans invade Denmark and Norway. May 10- Germans invade Low Countries and France; Sir Winston Churchill is new Prime Minister of England. May 15th- Dutch lay down arms and surrender to Germany. May 20th- Germans reach English Channel. May 27th- Dunkirk evacuation in France. May 28th- Belgium surrenders to Germany. June 10th- Italy declares war on Great Britain and France. June 14th- Germans enter Paris. June 22nd- France signs armistice. July 3rd- British action against French fleet at Mers-el-Kebir. July 10th- The Battle of Britain begins. July-October- Closing of the Burma Road. August 4th- Italians invade British and French Somaliland. September 14th- Italians invade Egypt. September 27th- Triparite Pact between Japan, Germany, and Italy. October 28th- Italians invade Greece. November 5th- Roosevelt elected president. November 11th- British attack Italian fleet at Taranto. December- British offensive in North Africa captures Tobruk and Benghazi. March 11th- Lend-Lease act signed. March 27th- Yugoslavia refuses to join Tripartite Pact. March 31st- First German offensive in North Africa:takes Benghazi and invests Tobruk. April 6th- Germans invade Yugoslavia and Greece. April 13th- Non-aggression pact signed between Japan and Soviet Russia. May 2nd- British invade Vichy-French occupied Iraq. May 20th- Germans take Crete. June 8th- British defeat Vichy French and Italians in Syria and Lebanon. June 22nd- Germans invade Russia. July 12th- Anglo-Soviet Treaty of Mutual Assistance. August 14th- Roosevelt-Churchill conference, Placentia Bay: Atlantic Charter. August 17th- Fall of Kiev. August 25th- Anglo-Russian occupation of Iran. October 30th- Leningrad and Sebastbol falls; German thrust for Moscow. December 7- Japan attacks Pearl Harbor in Hawaii; Philippines, Hong Kong, and Malaya. December 8th- U.S. and Great Britain declare war on Japan. December 9th- China officially declares war on Japan and Germany. December 10th- Japs sink the "Prince of Wales" and the "Repulse"; Japs capture Guam. December 11th- Germany and Italy declare war on U.S.; Japs attack Burma. December 23rd- Fall of Wake Island. January 11th- Japan attacks the Dutch East Indies. February 8th- Fall of Rangoon. February 15th- Fall of Singapore. February 19th- Japanese bomb Port Darwin in Australia. February 27th-29th- Battle of Java Sea. April 9th- U.S. surrender at Bataan. April 18th- U.S. air raid on Tokyo. May 6th- Surrender of Corregidor. May 6-8th- Battle of the Coral Sea. June 4th- Battle of Midway Island; Japanese attack on the Aleutian Islands. July- Regular allied bombing raids begins on Ruhr and Hamburg. August 7th- U.S. landings on the Solomon Islands. August 9th- Civil Disobedience campaign announced in India. August 17th- First U.S. air raid on Germany. September 13th- Battle of Stalingrad begins. September 21st- Opening of U.S. offensive in New Guinea. October 23rd- Battle of Alamein. November- Regular raids on Berlin begin. November 8th- Allied landings in Morocco and Algeria. January- German retreat from Caucasus. February 2nd- German surrender at Stalingrad; Soviets recover Kursk and Rostov. February 8th- Wingate's expedition to Burma. March 2nd- Battle of the Bismark Sea. April 18th- Death of Admiral Yamamoto, at Bouganville. May 11th- U.S. begins to liberate the Aleutian Islands. May 12th- German-Italian surrender in Tunisia. May 17th- Attack on Ruhr dams. June 29th- U.S. landings in New Guinea. July 10th- Invasion of Sicily. July 25th- Dismissal of Mussolini. September 3rd- Invasion of Calabria and signing of Italian surrender. September 9th- Landing at Salerno. September 12th- Rescue of Mussolini by Germans. October 13th- Italy declares war on Germany. November 6th- Russians recover Kiev. Janurary 12th- Landings at Anzio. Feb.-March- Jap offensive on borders of India. April 2nd- Soviets enter Rumania. May 17th- Germans evacuate Monte Cassino. June 4th- Americans enter Rome. June 6th- D-Day, Allied invasion of German occupied France and Europe. June 12th- First V-1s hit London. June 15th- Americans invade Saipan. June 15th- First B-28 raid on Japan. July 9th- Fall of Saipan. July 18th- Resignation of General Tojo. July 20th- Attempt to kill Adolf Hitler by his own Generals. August 1st- U.S. recovery of Tinian and Guam. August 15th- Allied landings in Southern France. August 17th- Final victories in Normandy. August 25th- Allies liberate Paris. September 8th- First V2s hit London. September 17-30th- 'Operation Market-Garden' fails. October 20th- U.S. landings in the Philippines. October 25th- Battle of Leyte Gulf. November- Regular bombings of Japan begin. December 16th- German offensive in the Ardennes. Janurary 12th- General Soviet offensive begins. Janurary 17th- Soviets enter Warsaw. February 13th- Surrender of Budapest. March 7th- Americans cross the Rhine at Remagen. April 12th- Death of President Roosevelt. April 13th- Soviets enter Vienna. April 16th- Last Soviet offensive begins. April 28th- Mussolini is hung by Italians. April 30th- Adolf Hitler commits suicide in his underground bunker in Berlin. May 2nd- Berlin in Soviet hands. May 3rd- Japs surrender Rangoon. May 7th- Germans surrender at Rheims. May 9th- Soviets enter Prague. August 6th- First atomic bomb is dropped on Hiroshima. August 8th- Soviet Union declares war on Japan. Auust 9th- Atomic bomb is dropped on Nagasaki. 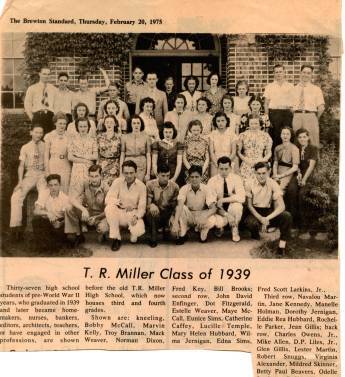 When Jean Gillis (far right, second row from top) graduated from T. R. Miller High School in 1939, the world was hurtling toward war. While it was exciting to be graduating, for her it was Friday. Her dream was to be a nurse, and for that she would have to leave home. 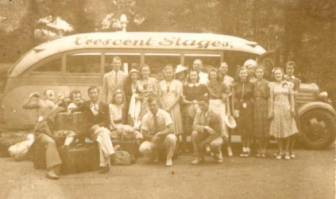 Up until that point, the extent of her travel had been bus trips to Shocco Springs with her church group. The idea of leaving home was exciting and scary. Her father, John Patrick Gillis, had been killed by logs that crashed into his truck when the ropes broke on the log truck ahead of him when she was thirteen. Her mother, Eunice, still had four younger children at home. Patricia, the baby, was three months old at that time. So, accompanied by her Sunday School teacher Miss Lydia Davidson, she paid a visit to Mr. McMillan, the president of the local bank. 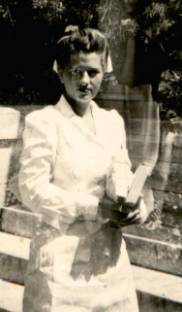 There she took out a loan so that she could quit her job at the dime store and the book keeping she had been doing in order to attend nursing school at St. Margaret’s hospital in Montgomery, Alabama. It took courage to sit across the desk from the banker and ask him to trust her with the loan for her education. Her brother worked at Stokes Meat Market. He’d saved up some money from his work at the meat market and his paper route and bought her suitcase. Her mother bought her a new outfit. She boarded the bus in Brewton, Alabama. She cast a longing look behind her as the Greyhound bus pulled away from the station. Fear and anticipation set her heart pounding as she left all that was familiar behind. But with determination, she directed her attention ahead of her excitement rising in anticipation of what life had in store for her. It was just Monday. 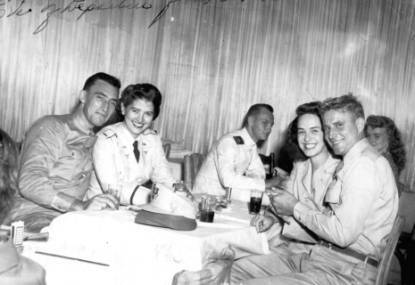 While she was sequestered in the security of South Alabama, playing pranks on her roommate from Atmore, Alabama, and convincing the Sisters there wasn’t a serious bone in her body, the world was rocked with the news from Europe and in the Pacific. They were not immune from the goings on throughout the world. When Japan attacked Pearl Harbor and the United States entered the War, young men from her home town began signing up. Her brother, James Patrick Gillis, enlisted in the Marines. Those young men were going to serve their country. Her father, John Patrick Gillis, had made the trip to France in the War that was meant to end all Wars, World War I. That hadn't happened. Now, it seemed inevitable. Someone had to go and finish the job. And someone had to go and patch those up who were injured in the process. It could be her little brother lying injured on a battlefield far from home and family. Those young men were going to serve their country. Could she do less? So she when she graduated from St. Margaret’s, Jean also enlisted. For her, it was just Tuesday. Eunice Jernigan Gillis, Jean’s widowed mother, had already sent her only son off to War. 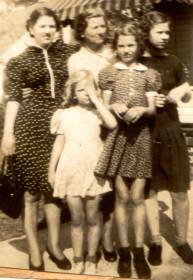 She left the three younger girls at home to accompany Jean as far as she could on the train. The two had always been very close. Jean had shouldered as much of the responsibility for her family after her father’s death as her young shoulders could bear. She often said that she and her mother grew up together. The many pictures in her picture collection attest to her recollection that picture taking was one of the favorite pursuits of young Americans. Here she met Eddy Cooley whom she dated during her sojourn in Jackson. The picture to the left is captioned, Cow Pasture, March, 1943. These patients had already seen service and were recuperating at her first assignment in Jackson, Mississippi. 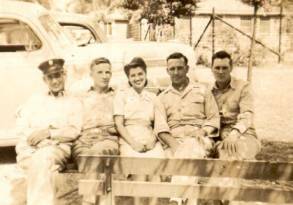 From Atlanta they went to New York where they boarded a troop ship bound for Cherbourg, France, where she would join the 164th General Hospital for detached service with hospital trains then sent to bring soldiers wounded at the Battle of the Bulge back from the front. When a soldier was injured he was taken to a field station where they performed triage. They were then transferred to the hospital train and taken to Cherbourg to board a hospital ship to be transported to a hospital away from the field of battle. She earned a battle ribbon for this service. This was the 165th General Hospital station set up outside Cherbourg. 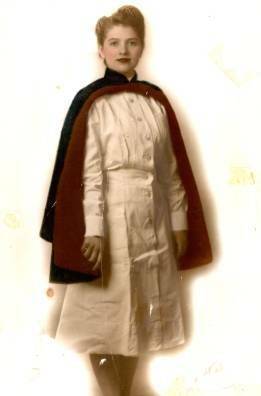 One of her occupations was writing letters home for patients. It was cold…so cold they wore everything they owned layered so thick that the call to the “loo” was a time consuming, sometimes anxious, experience. There occasionally was time to see the sights. Cherbourg was a beautiful city with warm and friendly people. 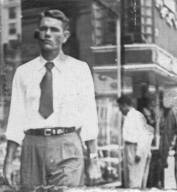 Americans enjoyed the town life. There was quite a different dress code for going into the city and for everyday frontline activities. This group of nurses grew quite close during their time together. Although she requested that this picture be eliminated, as her daughter who loves her, I felt it only showed another side of a fun loving young woman. These eggs have significance. They were rare. The hospital train stopped briefly as its engineers were constantly doing to chat with those beside the rail, Jean spied a farmer beside the tracks selling eggs. It had been so long since she’d had any eggs, she decided to jump down, buy the eggs and then hop back on. As her luck would have it, the engineer completed his conversation just as she was purchasing the eggs and the train began to roll off. Putting the eggs in her cap and gingerly clasping the precious commodity to her chest, she hurried back to the train which continued to pick up speed. Her friend stood on the back of the train and taunted her as she jogged breathlessly beside the train. “Share the eggs and I’ll stop the train,” he repeated over and over. She finally realized he meant it and agreed. Eggs, something she’d taken for granted in Brewton, Alabama, had gained new meaning. Finally, the War was over and they had time for some R and R before returning home. So, Jean and her friends did the Riviera. They saw the sights in Paris. Visited with other Americans in some of the night clubs. Penny, a fellow nurse and friend in France, actually wound up settling in Dothan, Alabama and had a child Jean’s daughter's age. (That was me! Penny's daughter, Debbie, became one of my best friends!) They rediscovered each other in Mrs. Camp’s first grade classroom in Dothan, Alabama, as room mothers years later. Finally they were headed home. Here they are aboard the ship headed home. Jean settled in at Augusta General Hospital in Augusta, Georgia, where she met Dr. Elkanah George Burson from Furman, Alabama. If the camera disappeared from the glove compartment of this car, he knew he was in trouble. I'm glad they took all those pictures. They married August 3, 1947. It was Sunday. This is her story. As her daughter I am impressed with the courage it took to leave home and go to war. Mother saw it as just another day.